The tropical sun slaps the waters of the Orinoco River as you lazily drift in a canoe under a lush canopy of trees. Suddenly, the jungle explodes with sounds as a howler monkey’s screech scares hundreds of colorful birds into flight. You grab for your binoculars while your travel companion focuses her camera. Flying into the sky are macaws, toucans, pelicans, parrots, kingfishers and dozens of exotic species that you have never seen before. The sounds of squawking and screeching and flapping wings then subside. The jungle quiets down once again beneath the steamy noontime sun. As you drift in your canoe, you see a bottle-nosed river dolphin jump out the water. This is why you left your home to visit Venezuela. This is what you always wanted to do: Go on a river cruise through a jungle. Welcome to your incredible bird watching and animal viewing river cruise vacation from Angel-Eco Tours. 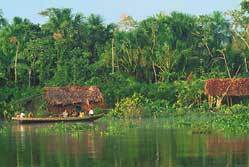 Let Angel-Eco Tours be your guide on a two or three day exploration of the dazzling Orinoco River Delta ecosystem. The Orinoco River spawns more than 300 tributaries that snake through a vast landscape, creating one of the world’s largest wetlands where birds and wildlife are abundant. The Orinoco River Delta’s bird life includes cormorants, brown pelicans, bitterns, herons, hawks, ospreys, toucans, macaws, hummingbirds, kingfishers and parrots. You will also see an unforgettable array of wildlife, including Orinoco crocodiles, manatees, anacondas, dolphins and monkeys. Few people are lucky enough to be able to experience such an array of exotic creatures in such a stunning and immense ecosystem. The Orinoco River Delta is one of the largest intact and unspoiled wetlands in the world. With the exception of the town of Tucupita, the Orinoco River Delta is a glorious expanse of forest, water and sky. Although bird watching and nature photography are at the heart of this river cruise vacation package from Angel-Eco Tours, you will also have the unique opportunity to interact with the Warao Indians. The Warao number over 20,000, and they are known as skilled fisherman and hunters who live in wooden dwellings called palafitos that are constructed on stilts over the water. The Warao are also gifted craftsmen who make elaborate figures carved from balsa and intricate baskets and hammocks woven from the leaves of moriche palms. This is a once-in-a-lifetime chance to journey to a pristine jungle village and experience the traditional culture of a native tribe. This Orinoco River trip also includes relaxed walking and optional swimming opportunities. Click here to view a video of the Delta. This trip can be combined with Angel Falls and Canaima National Park as well as the Harpy Eagle adventure and the Oriente. Tours run year-round. Of course, our itinerary is completely customizable to suit your adventure goals. Prices upon request. Can travel from Caracas, Ciudad Bolivar, Puerto Ordaz or Maturin airports. Gratuities are not included. Check group rates at time of booking. The price includes all transfers, boat and jungle tours, all meals and lodging. Relaxed - paced tour includes some walking, river travel in canoes, and optional swimming. You will be staying in comfortable wooden cabins that may have shared facilities (depending on the lodge chosen).